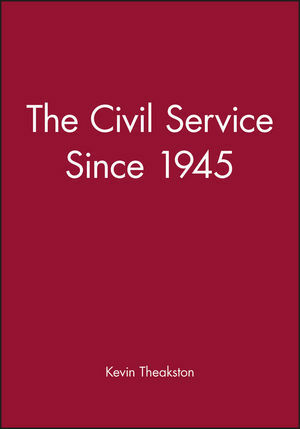 This book provides a succinct overview of the development of the civil service since the Second World War. Adopting a broad, historical approach, it assesses the changes in organization, structure and management of the Whitehall machine, alongside the continuities in the policy and practice of public administration. Kevin Theakston draws on the full range of recent scholarship, documents in the Public Record Office, and the many postwar offical investigations and reports to provide a balanced analysis of the key themes and issues. The book will be welcomed by all interested in the development of public policy and administrations, and post-war British politics in general. Kevin Theakston was educated at the London School of Economics and at Harvard University. He is currently Senior Lecturer in Politics at the University of Leeds. His previous books include Junior Ministers in British Government (Blackwell, 1987) and The Labour Party and Whitehall (1992). 1. Ministers and the Mandarins. 3. Business as Usual: The Civil Service in the 1940s and 1950s. 4. Reforming the Machine: Whitehall in the 1960s and 1970s. 5. The Civil Service at the Crossroads: Thatcher, Major and Whitehall since 1979. 6. Whitehall Accountability and Control. * Provides historical background and context for students on one of key topics in contemporary history and politics courses. * Examines links between public policy and the personalities involved. * Draws on a range of primary documents and most recent scholarship.